Heat oven to 350°F (325°F for dark or nonstick pans). Generously spray bottoms and sides of 2 (9-inch) round cake pans with baking spray with flour. In large bowl, beat cake mix, oil and eggs with electric mixer on medium speed until combined. Gently fold in 1/2 cup decors. Divide batter evenly between pans. Bake 20 to 25 minutes or until cake springs back when touched lightly in center. Remove from oven to cooling racks; cool in pans 5 minutes. Turn cakes out of pans onto cooling racks; cool completely, about 45 minutes. Meanwhile, in medium bowl, stir together 1 container frosting and 1/3 cup decors. When cakes are cool, level cakes with large serrated knife. Place 1 cake layer on serving plate or cake stand. Top with thin layer of frosting. Place second cake layer on top. Use remaining frosting to cover sides and top of cake. 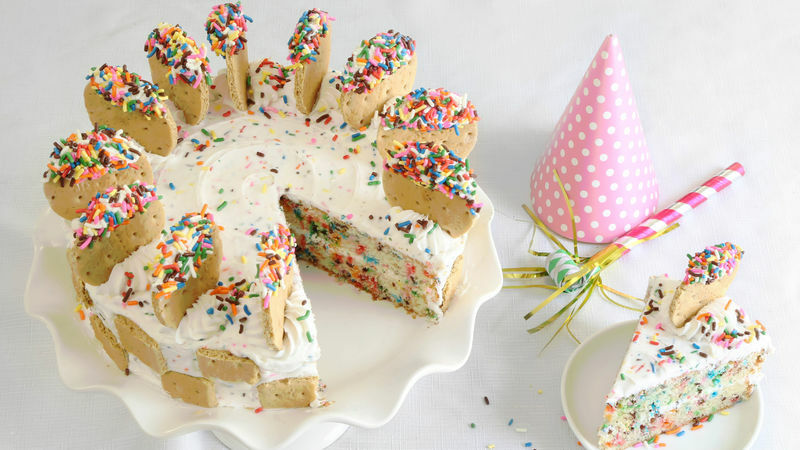 Chop graham crackers into pieces with large knife; place randomly on sides of cake. Transfer 1/2 container (2/3 cup) frosting to decorating bag fitted with large star tip. Pipe 12 rosettes around top edge of cake. Use small round cookie cutter to cut 12 rounds from remaining graham crackers. Place additional decors in small bowl; place remaining frosting in separate small bowl. Dunk each cracker round in frosting then dip into decors. Insert each dipped cookie upright into 1 rosette on top of cake. Sprinkle top of cake with additional decors. Store cake loosely covered at room temperature. If graham crackers are too crispy to cut cleanly, place them in a zipper-topped plastic bag with two pieces of white bread for 2 to 4 hours. This will make them soft and easy to cut. A chocolate Dunkaroos® version can be made by using Betty Crocker® Whipped chocolate frosting in place of the whipped cream frosting.